So I thought I'd try out this Chorizo Meatballs Recipe minus the chorizo. It didn't go so well. After browning the meatballs, as per the recipe I added half cup of water. Not such a good idea when its a hot saucepan. It looked like a volcano was erupting out of the saucepan and... BAM. Smoked the home out! But anyway not to worry so, I pushed on with the recipe and added the tomato [paste], turned my back and... BAM! 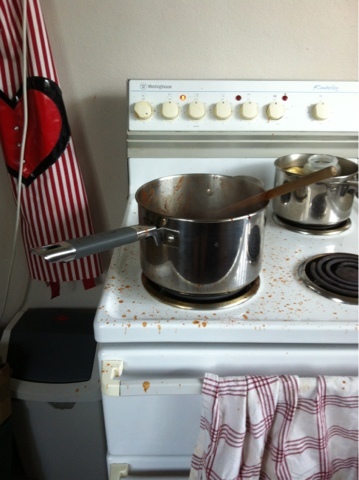 Tomato sauce spitting EVERYWHERE! 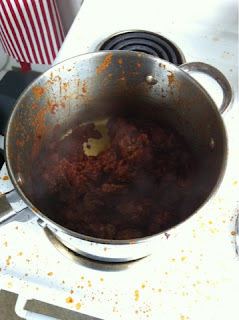 Well couldn't give up there so, I continued with the recipe and added the meatballs and... **sigh** They fell apart. It better still taste alright!